With this volume the RASC joined other Canadian institutions in presenting to the Canadian public—and the world—projects marking the centenary of Canada's confederation (1867-1967). 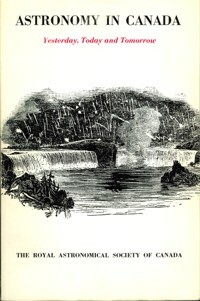 Originating as a themed collection of nine articles describing the state of Canadian astronomy in the centennial year, it appeared in both JRASC, and under separate covers as a book issued by the University of Toronto Press. The articles are available online via ADS using the links below. Copies of the book version can occasionally be found in antiquarian book stores. Astronomy in Canada has had a long and proud history. At one time, the largest astronomical telescope in the world was situated in Canada, and today Canada is still a world leader in all aspects of optical and radio astronomy. The widespread popular interest in astronomy in Canada is demonstrated by the hundreds of thousands of people in Canada who visited observatories and planetariums during the year. As its Centennial project, The Royal Astronomical Society of Canada has set out to fill a severe gap in the literature of astronomy in Canada, namely, the lack of a good book on the subject. 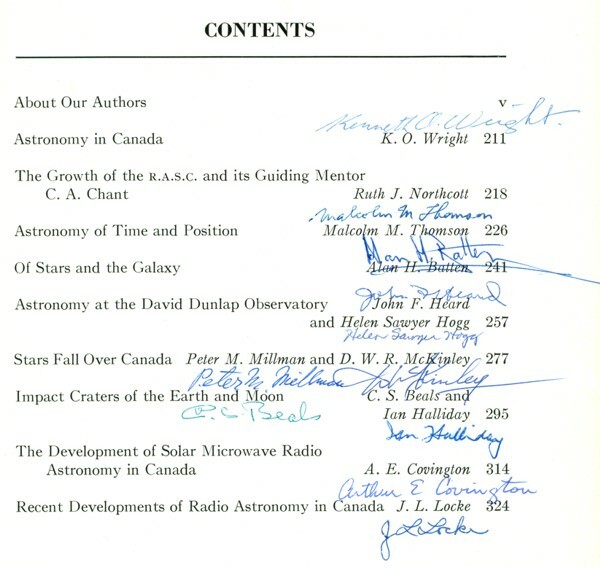 The result is "Astronomy in Canada - Yesterday, Today and Tomorrow", a book of essays dealing with the history and present status of Canadian astronomy. The book is profusely illustrated, well printed on glossy paper by the University of Toronto Press, and attractively paper-bound with a two-colour cover. Each author is a professional astronomer and an experienced writer. The level of presentation would appeal to a senior high school student or intelligent layman.